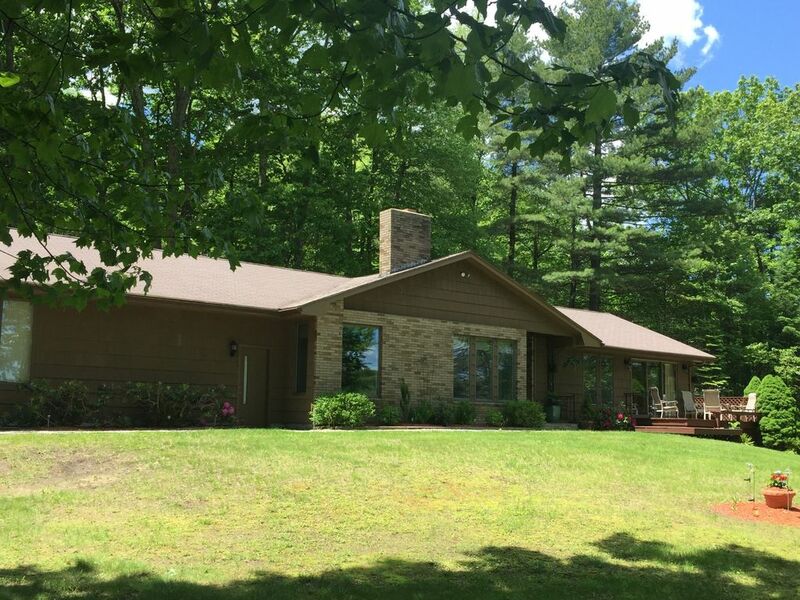 Enjoy your summer vacation get-a-way on beautiful Lake Manchaug in this lakefront home in peace and quiet enjoyment. This is a 2 bedroom, 2 bath home with a wrap-around deck and attached screen house complete with 2 car garage. Home has been upgraded and updated with hardwood floors, indoor laundry, dishwasher, microwave, refrigerator with ice maker, stove and range. Plus, all the necessary items to prepare your meals. Indoor laundry has washer and dryer. Hairdryer in master bath. Electric fireplace in living room. Cable TV and Wi-Fi wireless internet available for your entertainment in living room and master bedroom. 55 " Wide screen plasma in living room. The gas grill is located just outside the kitchen door on the wrap-around deck. there is a fire pit in the front yard overlooking the lake for those relaxing and story-telling evenings. For your side trips, why not a day in Boston sightseeing and taking in the culture; just 45 minutes away. Or, even closer, why not head over to Cape Cod for an amazing lobster dinner? Or cook your own magnificent lobster dinner here. Like sightseeing? Even closer is Newport, Rhode Island with the tour of mansions and scenic views and breezes of the Atlantic Ocean. Hungry? There’s a major supermarket and other shopping just 15 minutes away, the Market Basket. Don't want to leave the property? Just bait you hook and drop you line into one of the best bass fishing lakes in the area. And finally, for you golfers, there is the nationally recognized Blackstone National Golf course just 15 minutes away. Golf at the Reese Jones Blackstone National Golf Course - 10 minutes, Brimfield Flea Market-May/July/Sept - 40 minutes, Newport Mansions - 1hr. Horseback riding, beaches, hiking and biking in the Douglas State Forest - next door. We are in southern Worcester county bordering Ct. and RI. Great location as it is near Rt146, RT. 395, RT. 290, and 10min. to the Mass. Pike. We are located on Lake Manchaug in Douglas. The lake is approx. 7 miles around. There are many vineyards nearby - Taylor Brook to name just one and we are very close to a wonderful section of Ct. Woodstock, Pomfret and Putnam which are full of antique shops. Go ahead... use Google to find your own local attractions... we did. Douglas and the lake area is like being in Maine without the long drive and the traffic. The main bathroom has a vanity area for your convenience. Also a skylight, and plenty of towels. Outdoors: Badminton, Croquet, Horseshoes, Frisbee. Indoors: Misc. board games. This home is a great place to enjoy Lake activity, and family fun. Half an hour from home but a world away! We live in MA but found this rental by accident and enjoyed a late summer stay. The yard is large by any standards but HUGE for a lake front property. It gave ample room for our family to spread out under the shade trees, swing in the hammock, sunbathe, throw a football, play horseshoes and fish. Unlike so many waterfront homes that are stacked one atop another, here you really feel as though you are in your own oasis. The home is well appointed right down to kitchen gadgets and any creature comfort you'll need and affords a unique and beautiful view from every room. Nature lover? Take your morning coffee in an Adirondack chair while you watch the Bald Eagles soar and fish. We are thankful the owner shared this amazing property with us and will be back soon. A couple of other notes. This house is CLEAN and you will begin enjoying yourself the moment you arrive. If you like to cook, do not overpack groceries or worry about having the right condiments and seasonings, a full service market is just a few miles away. No need to bring wood for the lakeside firepit. There is an enterprising lad at the end of the street who offers reasonably priced bundles. You can rent this property with confidence that you'll have an unforgettable stay. Thank you for that great review, and I hope you come back next year. I will be looking forward having you and your family on a return visit. I really enjoyed having you stay at my Lakehouse. As you turn off the main road, the meandering country lane gets smaller, and you start to wonder what you will find at the end of it... Then you're there, and rewarded with "a pot of gold!". Well, better than that. The well equipped, immaculately clean house sits on a special piece of land with plenty of shoreline. Even though initially the weather wasn't great, we thoroughly enjoyed eating out in the ample screened porch, and relaxing in the many different seating areas on the 'great lawn', including several benches and Adirondack chairs, a hammock, & swing for two. There is a good BBQ on the back deck (grilled surprisingly fresh fish from Market Basket), and a more cozy front deck off the master bedroom. When the weather warmed up, we enjoyed swimming in the very clean lake, and used the kayaks to explore. We had a hard time deciding to come here instead of fighting the traffic & crowds out on the Cape again, but we are so glad we did. Thank you Katrina for sharing your little bit of heaven. Terrific place!! Loved it! Will stay there again. House had everything we needed. House and lake were awesome!!! Fishing was the best we have seen ever!!! 10 Star Lakefront Vacation Home! We can’t say enough about how much we enjoyed our stay at Katrina’s house. It has all the amenities you could want in a vacation home and more! Tons of yard space to enjoy relaxing or something active like a game of horse shoes or badminton. We were able to bring our ski boat to tie up at the dock. Also, my father is in a wheelchair and he was able to move around easily on the level floors and he enjoyed the large shower that he could sit in. We also really appreciated that we could bring our dog with us to the house. When you sit at the fire pit at the tip of the property, you have an unbelievable view of the lake. It’s also a quieter part of the lake. We thoroughly enjoyed our stay and we will definitely return! Thank you Katrina! This home is truly a gem. The setting is absolutely gorgeous! The nicest lake home setting I have ever visited. The house is beautiful and has everything you need. It is well maintained and very clean. The property was graded with undulating small hills of expansive lawn down to the water's edge that is bordered by a beautiful old stone wall. It is lined with beautiful old growth trees, providing the option of sun or shade all throughout the day. The beach area is wonderful and there are canoes, kayaks and a row boat available for water activities. The owner provides a number of seating areas around the property and it has a beautiful screen house overlooking the lake. There is a fire pit and Adirondack chairs located right on the edge of the property overlooking the lake. The house is well appointed and has central air. Katrina, the owner, is a wonderful hostess and very responsive to her renters. Can't say enough good things about this property. We can't thank Katrina enough for sharing her beautiful home with us. Thank you Bernadette and Susan for your wonderful review of my Lakeside property, and I hope you will return again next Year. A lovely home on great property. We really enjoyed our stay. The home is quiet and peaceful and the property is beautiful. A great place to relax! Water slide 10 min away. Public boat launch minutes away around the lake. Indian ranch for summer concerts.Old Sturbridge Village for fun and interesting day trips. Property manager will deliver the key or a lock box will be placed on the property and combination provided.